Let’s face it, ladies: No one wants to get hangry at work — and long workdays are only made worse by sugar crashes. So a working woman’s gotta eat smart during the workday! But what are the best foods to maintain your energy during a long day at work? Which are YOUR favorites to keep your mind and body fueled properly? 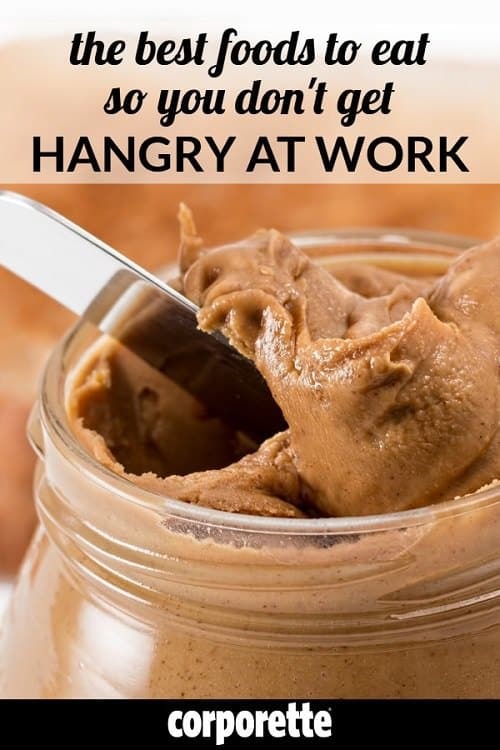 Do you have any other tips on how to avoid getting hangry at work? Good strategies to follow for maintaining your energy at work are eating frequently to keep your blood sugar at the proper level (no skipping meals! ), choosing protein-rich foods and complex carbohydrates, and drinking enough water. Wise choices include nuts and nut butters, eggs, yogurt, oatmeal and other whole grains, fruits and veggies, and high-protein salads. Today we’ll focus on choices that are healthier than grabbing some chips from the vending machine or chocolate from the communal candy jar; eating a lot of fat and/or sugar will actually make you more tired in the long run — but if you have any high-energy favorites from the vending machine or local bodega, we’d love to hear em! Oatmeal: Steel-cut or otherwise (readers recommended Kashi and Nature’s Path brands), perhaps with some berries or another healthy mix-in. 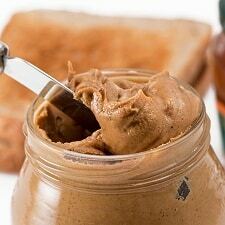 Peanut butter: On whole-wheat or sprouted-grain bread, bagel, or multigrain waffle. Eggs: On an English muffin, with meat (like ham or sausage), etc. Yogurt: Mix in ground flaxseed, honey, fruit, walnuts, granola. Smoothies: Add protein to make them more filling — yogurt, kefir, soy milk, protein powder. Burritos/wraps: Make them ahead of time and simply freeze and reheat, like this highly-rated recipe or this one. Yesterday’s leftovers: YMMV, based on what you usually eat for dinner, of course! High-protein salads: Be careful, though; dressings with a lot of fat or sugar can make you feel sluggish later. Bean salads are an excellent option. Sandwiches: Readers suggested combinations like apple and cheese, peanut butter and banana, and turkey with hummus and spinach. Takeout options: Panini or Bistro Boxes from Starbucks, sushi, healthy soup. Dairy: Yogurt (Greek or otherwise), cottage cheese, Laughing Cow cheese, string cheese. Packaged bars: Kashi, SoyJoy, Atkins, Odwalla, Special K.
Fruit and veggies: Apples, bananas, oranges, berries, grapes, dried cherries, baby carrots (with or without hummus). Nuts and nut butters: Almonds, cashews, walnuts, pecans; try peanut butter on whole-wheat toast/bread, rice cakes, pretzels, bananas, or apples. Other: Popcorn, oatmeal, trail mix, tea (green, English Breakfast, Moroccan mint). Current image (PB) via Stencil. Original image (2016). Ladies, let’s hear from you: Which energy foods seem to help you get through a busy workday without crashing? What do you eat on a typical workday, and what do you do about dinner when you have to work really late? How do you avoid getting hangry at work? To make smoothies more filling, I like to blend some oats into them. I like to add chia seeds as well. I will usually soak oats + chia seeds overnight and then add that to my smoothie base. I like those Belvita biscuits for a light, mid-morning boost. My lunch is almost always a chicken breast over a bed of brown rice, and a side of raw veggies. I mix it up by using a different seasoning or marinade each day of the week. Good, healthy way to fuel up on protein and fiber, and I can make 2-3 lunches at once on Sunday evening. Although I’ve started to incorporate a brown rice and pinto bean mix into the week. Pinto beans rock. I like almonds too, but I have to be careful to only bring a small portion at a time, if I bring a lot at once I’ll eat far too many and feel sick. I guess that’s why they’re called ALLmonds. Oh man I hear you on almonds. I found a recipe on some paleo blog or other – roasted almonds with salt and rosemary. Delicious. And gone in one sitting. I love all kind’s of nuts–peanut’s, walnut’s, almond’s, pecan’s, and even sunflower seed’s, tho those are NOT technicaly NUTS. I wind up eating alot of them and that is why I have a large tuchus, Dad says, but I do NOT eat alot of sugary sweet’s, which also causes peeople like me (who sit in my tuchus all day) to have a big tuchus. Nuts are better for you anyway, he says. Also, I LOVE Brazil Nuts, but all have to be shelled FIRST, b/c I do NOT like to waste alot of time peeling nuts first. FOOEY! I love Belvita also – I usually eat two from the packet with a tablespoon of peanut butter smeared on each. This post is so timely for me! I make all of my meals for the week on Sunday. Some kind of egg concoction for breakfast, salad for lunch, and soup/chili/stew for dinner. I’ve been in a lunch rut lately. I try to alternate between spinach salads and kale “ribbon” salads but neither seems very satisfying right now. Suggestions? Also, for others who pre-make your meals, how do you introduce variety into your diet? Making all my meals ahead of time is already something of a daunting task; the idea of making a variety of meals seems overwhelming. But then of course by Friday I’m so tired of what I’ve been eating all week that I tend to binge on bad foods. Would love to hear how others manage. I make batches of single serve things and then freeze them in individual portions. I’m on maternity leave but going back to so work soon, so I’ve been going a little crazy. Today I’m making: Quinoa/Lentil burgers (freeze in a stack with parchment paper between each one, microwave and eat with a salad), butternut squash mac and cheese, cauliflower leek soup. In the freezer I have: Roasted carrot soup, baked ziti with 50% whole wheat pasta/50% broccoli, Mexican Lasagna, a couple of quiches, etc. I do the same thing. I made a kale and chicken sausage sauce this weekend that I froze into individual portion sizes with ww pasta for some and spaghetti squash for others. I also make the ingredients for the rice bowls in advance. I usually do 2 meats (e.g. Asian flank steak and Cuban pork), then roast and/or steam a bunch of veggies and make a big batch of brown rice. Each night I’ll mix and match meat, veggies and brown rice/beans with different sauces/toppings (salsa, teriyaki, avocado, etc), so that it’s not the exact same meal every day. Works really well and it’s a great way to get lots of veggies and fiber. The rice bowl idea is genius. I’ve been making a big pot of soup and eating it every day but once (if it ever) gets warm, soup is probably not the best lunch. Plus it may be nice to have some variety. I have a bunch of different marinades and seasonings for my chicken breasts. Caribbean jerk, Korean BBQ, cajun flavors, southern BBQ marinades and dry rubs, etc. and when I make 2-3 chicken breasts on Sunday, I make a seperator with foil on the baking sheet so I can do all 3 at once, each in its own compartment. At some point during the week, if no lunch plans or yummy, lunchable leftovers pop up, I might make a lunch with rice boiled in Mexican seasoning, then mixed with pinto beans or ground beef and topped with cheese. On Sunday, I make three or four meals — one for Sunday night/Monday lunch, one for Monday night/Tuesday lunch, etc. Usually I make three and one night, Thursday, is leftovers or quesadillas or something. The way I am currently handling variety is to vary the “types” of meals — i.e., tacos/rice bowl/pasta/soup/quiche/big salad etc. using some of the same base ingredients for efficiency’s sake. Often this means roasting or steaming a million veggies that can be used in any/multiple of those types of meals over the week, baking a big batch of tofu or meat, rinsing beans, etc. For us, we’d rather have the same thing for dinner and then lunch the next day than have the same thing for dinner every day. Then on Friday we are at someone’s house or my husband is charge of dinner. I make 1 or 2 big pot meals on the weekend, so that I always have a variety of options in my freezer. For example, right now I have southwest pasta, coconut chickpea curry, and 2 different homemade soups in the freezer, so that’s a different meal each night that I just have to microwave when I get home. 1 batch of southwest pasta makes about 8 servings (so 4 meals for me and my husband), so even if I only get around to cooking 1 thing on a weekend, I get a couple weeks of variety out of it. Other favorites include the Kitchn’s chicken and wild rice bake, and their freezer frittata and twice baked potatoes. Plus, I keep a lot of basics in the fridge and freezer (frozen veggies, grilled chicken, and potatoes, plus eggs and salad basics) so I can whip up something fresh on a whim if I have the time. I’m also a big fan of Belvita biscuits for a mid-morning snack. They’re surprisingly filling. I usually keep one in my purse as well. My other go-to desk snacks are almonds, string cheese (I like Target’s part skim mozzarella), and the Kashi almond, chocolate and sea salt bars. Lunch: Romaine with chicken breast and low cal dressing. Other greens are healthier, but romaine keeps the best. I’ll throw in other stuff like no-added sugar raisins or radishes. Sometimes I’ll have leftovers from diner. Rarely, if I am feeling really feisty on the weekends, I will pull a salad or grain bowl recipe from Cooking Light. I am a huge believer in Sunday prep. I will spend an hour cooking chicken, portioning out breakfast and snacks, and putting together meals for the husband to cook each weeknight (I prep the meals, but he gets home first, so he will actually execute the meals). Each dinner recipe comes from Cooking Light or My Fitness Pal. Sunday prep has really helped me eat healthy and not give into the temptation of just grabbing something that is loaded with dressing. FYI – Romaine is also the lowest carb of the salad family. People are worried about the carbs in lettuce now? No. This can’t be a thing. Many greens have little nutritive value, but certainly aren’t bad for you. Nobody ever became unhealthy by eating too much lettuce. I love cottage cheese and Greek yogurt as snacks but I prefer the 2% or whole— makes such a difference in taste & texture & richness, to me. More calories, of course, but the portions are small anyway. I’m lucky enough to have space for a snack drawer in my desk plus colleagues who don’t use the office fridge much, so here’s what I keep at hand: Special K; fruit leathers or some other natural fruit snack; snack-sized bags of pretzels for when I want a carb fix; shelf-stable “emergency” meals, like GoPicnic. In the office fridge/freezer: Amy’s frozen meals; Evol frozen burritos; commercially available green juice, such as Evolution Fresh; hummus; sometimes when I’m feeling really ambitious, I leave cold cuts in there for protein throughout the week. For lunch I generally bring leftovers from last night’s dinner or eat a frozen Amy’s meal. We use the Fresh20 four-person plan for just the two of us, which makes for perfect leftovers the next day. I do the same, but for lunch. It’s so easy (and cheap! and healthy!) to rinse a can and add a bit of something. For black beans, I add frozen corn (it thaws by the time I eat), salsa, and cumin. Unfortunately avocados are not readily available in my region. For chickpeas, I add curry powder and sometimes a dollop of plain yogurt. I eat with carrot sticks. For kidney beans, I add salt. Turns out, I like plain kidney beans, lol. I do have other fresh veggies and a hard boiled egg or quick tortilla/turkey roll-up. Re: kidney beans: red beans and rice! I have both a mini fridge and a snack drawer in my office because I get super unproductive the minute my blood sugar dips. I always have some mini soups (both Pacifica and Campbell’s make great 100 and ~250 calorie packs, high sodium but great for a boost), wasabi peas, nuts, Somersaults, peanut butter, instant miso soup from Trader Joe’s, and homemade instant oatmeal packets. In the fridge I always have a couple protein shakes, fruit to throw into oatmeal (apples, berries, etc. ), carrots, some guacamole or avocado packets, and frozen edamame. I also make my meals weekly whenever possible. Big fan of egg muffins/mini quiches or no-bake energy bites for breakfast, and various soups/stews/chilis/curries for lunch. One of my favorite comfort foods is to cook rice in chicken stock and coconut milk instead of water – it’s super filling and easy to make a week’s worth, and then you can throw whatever veggies and protein you want on top. +1 for wasabi peas. They work well for me because the heat keeps me from over eating. I sometimes have coffee in the morning, but then it’s just water and green tea for the rest of the day. I forgot that avocado toast is another fav for breakfast or a snack. Yum! I eat a lot of the same things frequently and breakfast is always the same – it’s easier for me and makes Sunday meal prep easy. This x1000. I will indulge occasionally (there might or might not be a cookie on my desk), but cutting sugar/grains from your regular diet completely eliminates the crash that necessitates the sugar pick me up that leads to another crash. Eat because you’re hungry, not because you’re tired. Do they sell spaghetti squash that is frozen? I really want to try it, but would prefer to buy it frozen vs. mess it up myself. Thanks! It’s really, really easy. Just cut it in half, scoop out the seeds, place face down on a baking tray, and bake at 350 for a half hour. I actually just microwave it. Take squash, stab (carefully…) all over with a knife or fork, nuke in 5 minute increments, rotating between each one, for a total of 15-20 minutes. Cut squash in half (easier now that it’s softened), scoop out seeds, separate threads with fork, done and done. Agreed, it’s so easy and actually yummy by itself with just a little salt – I cut in half, bake with olive oil and garlic, and scoop out. Seeds can be done before or after (cleaner before, easier after). I love you for posting this – this is a real honest to God issue I struggle with and now am on meds for insulin resistance. I usually make an effort to eat much healthier at work than I do on the weekends, because it really helps keep my energy up. But oh man…around 10am, all I want is a croissant/donut/muffin/scone. It is so hard to ignore this craving!! I had to really up my meal/snack game when I was pregnant with my first and diagnosed with gestational diabetes (completely out of the blue – in the best shape of my life and already a healthy eater). Not being able to reach for easy carbs makes planning a necessity! In the morning I would have two eggs (scrambled or boiled) with a piece of whole grain toast (usually Dave’s). Mid-morning I would have cottage cheese (2% or whole fat to keep me full) and sometimes mandarin oranges (drained and rinsed!) or a vetted lower-carb yogurt which was often full fat instead of low-fat. Low- or no-fat yogurt often has added artificial sweeteners that up the carbs or messed with my stomach. For lunch I would often have high-protein salads – adding chicken, eggs, any kind of protein! My doc also told me to add healthy fats like avocado and to embrace the fats! Sometimes I would have soup and fortify it with a cup of frozen vegetables – green beans were my favorite because of the fiber. Other snacks I would keep around were almonds, any kind of nut butter, cheese, and all kinds of vegetables. Managing diabetes taught me a lot about portion control and keeping the blood sugar at a stable level, which has helped me to this day! Carbs are NOT the devil – I got in trouble with the nutritionist if I didn’t eat enough carbs throughout the day. It’s the over-eating of carbs or ONLY eating carbs that will get you into a sugar crash. But if you aren’t prepared, carbs are the easiest to access! I had to get it together when I joined Weight Watchers. Right now I’m loving: frozen cherries thawing overnight w/chia. I mix with 2% Fage, no sweetener needed. If I’m super hungry I’ll add some corn flakes for crunch. Cooking Light has an amazing crustless veggie quiche recipe that, with fruit, works for breakfast or lunch. Rice bowls – brown rice, a protein, seasoning (salsa, curry, soy/mirin, etc.) and veggies is my current lunch kick. The Amy’s frozen gluten-free lasagne is good in a pinch.